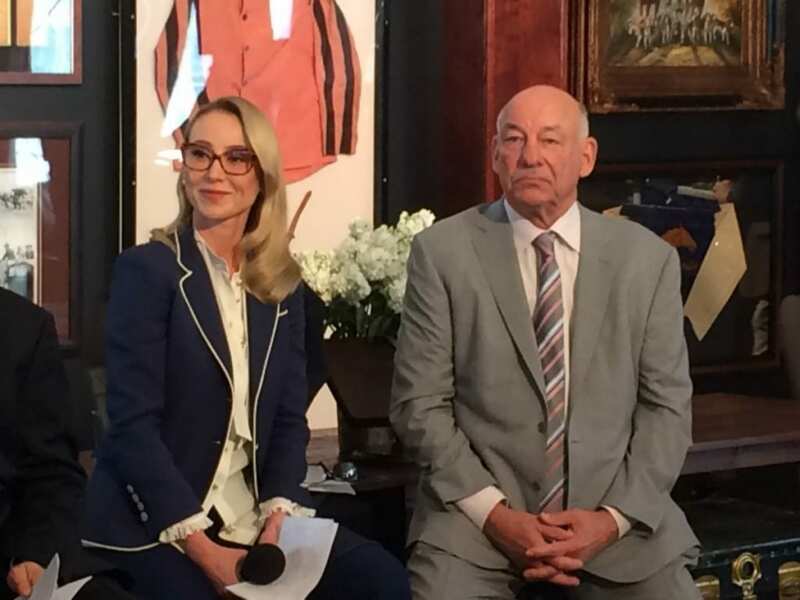 Belinda Stronach with Jack Wolf at Pimlico on May 20. Belinda Stronach is president and chairman of the board of the Stronach Group, the company which owns the Maryland Jockey Club, as well as Gulfstream Park, Santa Anita Park, Golden Gate Fields, Portland Meadows, and non-racetrack companies Xpressbet, Amtote, and Monarch Content Management. The Stronach Group took ownership of those horseracing properties after the 2009 bankruptcy of Magna Entertainment Company. Stronach, 50, began her career on the board of directors of Magna International, the automotive supplier founded by her father, Frank Stronach, and later joined the company as vice president, eventually becoming chief executive officer. She served as a member of the Canadian Parliament, from 2004 to 2008, and she has numerous other business and philanthropic interests. Stronach has recently begun to play a larger role in the operations of the Stronach Group, We sat down with her May 20 in the Stronach Group tent at Pimlico Race Course to discuss her vision for the company, for horse racing, and for the Maryland thoroughbred industry. THE RACING BIZ: In racing circles, the chatter has been that you’re not really a “horseracing person.” What’s your, for lack of a better term, relationship with racing? BELINDA STRONACH: Lucky gene pool, I guess. My family’s always had horses on the farm. I grew up on the farm. I spent a lot of time at the track when I was a kid because I got taken there on weekends. Probably at the time I would rather have been doing other things, but I grew up in the racing business. I didn’t participate from a work standpoint early on because I went the other horsepower way, the automotive business (Magna). Without digressing into my background, I went into politics and then I came back. When I came back, the timing was around when the family took 100 percent control of the tracks. One of our objectives, as you know is to invest more in entertainment, technology, expand our social media platforms and really appeal to a new demographic. THE RACING BIZ: How important is the state of the industry as a whole to that effort? THE RACING BIZ: What you’re talking about — turning the casual fan into the frequent, or even diehard fan and bettor — is something that racing has talked about and thought about for years without making inroads. What do you think needs to happen in that regard? We have to have a good social media presence to connect with a younger demographic and share what we’re doing here. We have to have a great customer experience, not quite Vegas-style, but doing things better. I think [the Stronach Group] tent is an example of that. We wanted to think out of the box a little. The theme here is SoHo house meets Ralph Lauren, which for the Preakness, we wanted to respect the traditional nature of the Preakness but bringing in some modern elements. If you’re not a daily racing fan, you can come, socialize, place some bets, and get to know the sport. The overall customer experience is something we’re trying to make a lot more fun. THE RACING BIZ: How important are Maryland the mid-Atlantic to the company’s efforts? BELINDA STRONACH: It’s really important to us. Tim [Ritvo] is our key person on the job, our COO, and this is where he is spending the majority of his time to make sure we’re running the best show that we can given the current facilities that we have. I know Tim has lots of ideas of how to make improvements here and also at Laurel. Yesterday we talked about the [$12 million] Pegasus Cup as a new model of how we can do things. I think it’s certainly an option that we bring something like that to Maryland, one of these super-races. I think there’s lots of ideas that we have; it’s really important to us, horse racing in Maryland, and it’s a top priorty to say what can we do with these amazing assets that we have, and how do we make it even a better experience for all the stakehodlers: the customers, the horsemen, the jockeys, everyone. The racing industry is one of stakeholders, and I think we can take a great leadership position to modernize the sport. THE RACING BIZ: Is it your intention that the Preakness and racing remain in Maryland? BELINDA STRONACH: Yes, yes, yes. THE RACING BIZ: Where does the ongoing Maryland Stadium Authority study on the future of Pimlico fit into that vision? BELINDA STRONACH: I don’t know what the Stadium Authority is going to say yet. Our intention is to continue to invest in the sport, make it great, and Maryland is a huge part of that. THE RACING BIZ: Do you view what the Stronach Group is doing as, in part, a kind of legacy for your father? BELINDA STRONACH: I see it — he loves horses. He loves horse racing. He’s made huge investments, the family has made huge investments, so he wants to do it right. 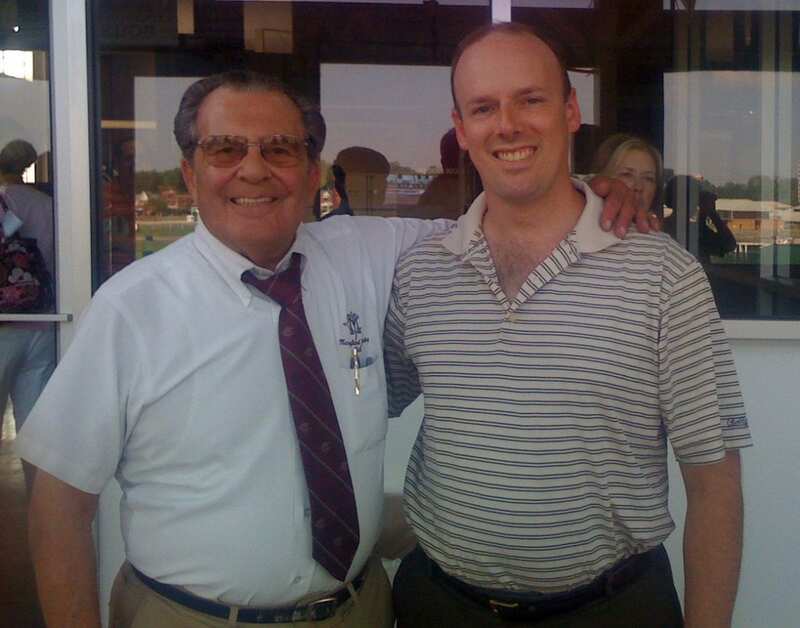 So the best legacy we can make is to really run a great show and build a great company and work together with the communities where we operate and all the stakeholders — owners, jockeys, horsemen, racing commissions, local officials, it’s a stakeholder sport – and really do a great job where we earn the respect of these various stakeholders, and we increase our fan base. That’s the best future that our industry can have.